One of the best parts of the holidays is all of the delicious food. A popular dessert and snack that is often enjoyed during the holidays is a cookie! Cookies are even celebrated with their own day on Tuesday, December 4: Cookie Day. When it come to cookies, there are many different types and varieties. From drop, cut out, and thumbprint, to cookie bars and sandwich cookies, there is a type of cookie that pleases everyone! While cookies are a treat and have been traditionally unhealthy, they do not always have to be. Many can enjoy a cookie if the ingredients are adjusted to create a healthier treat. In a large bowl, mix the flour, baking soda, and salt. Set aside. Cream the butter, avocado, and sugars together. Add in the eggs and vanilla. Slowly incorporate the flour mixture. Once dough is formed, stir in the chocolate chips. Spoon onto a cookie sheet. Bake at 375 degrees F for 10 minutes or until edges are golden. 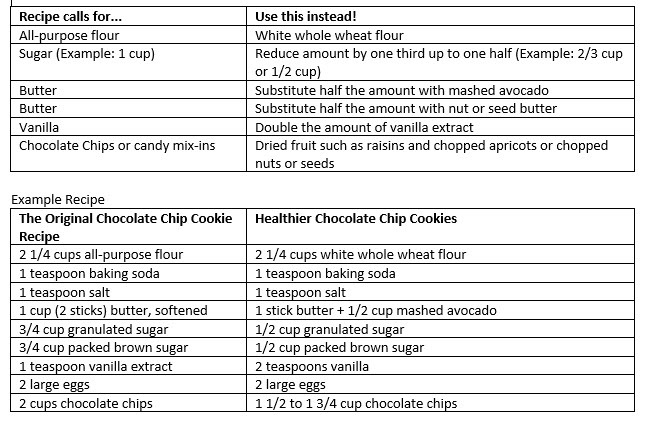 With this healthier recipe, someone with diabetes or heart disease can enjoy a cookie without feeling guilty. Children can also enjoy these cookies since they are whole grain and a better source of energy compared to the traditional cookie. Choose a recipe using nut or seed butter - Our Family Peanut Butter is on sale this week and adds healthy fats, protein, and even a small amount of fiber to any cookie recipe. While making cookies can be easy and fun, we must remember baking is a science. When adjusting and substituting ingredients in recipes, try just one at a time to know it works. If you adjust or substitute too many ingredients and the recipe flops, you won't know why. Some recipes can handle just one, while others like the recipe above can handle a few adjustments and substitutions. Be patient and try just one at a time until you know what works, and what doesn't! While you can make cookies healthier, that does not mean you should eat more of them. To be healthy - no matter what recipe used - eat just one cookie and maybe share it with a friend! Happy Cookie Day!